St. Francis de Sales School has provided a first class education to thousands of students since opening in 1949. As part of a nurturing community with strong sense of family and parental involvement, SFDS fosters Catholic values, academic excellence and community pride. The administration, faculty and staff are committed to our school-wide learning expectations, "Working for the A's" so that all SFDS graduates are Active Catholics, Academically prepared, Accepting of others, Accountable for all actions and Articulate communicators. 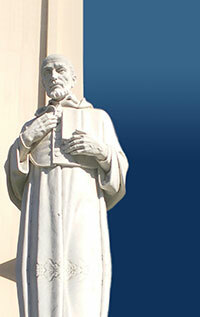 St. Francis de Sales School, with Reverend James O'Mahony as Pastor and under the direction of the Religious of the Sacred Heart of Mary, was established in 1949. The school enrolled 300 students in grades 1 through 8. After an exceptionally cold start to the new year in 1949 (it snowed in Sherman Oaks on January 10) St. Francis de Sales School opened for classes in September. The School Dedication Ceremony was held the following spring on April 30, 1950. James Francis McIntyre was Archbishop of Los Angeles at this time, and Mother Eugene, of the Religious of the Sacred Heart of Mary (RSHM) was our first principal. She was followed by Mother Regis in 1951 and there were eight others who served as Principal: Mother de Sales, Sr. Madeline, Sr. Wilfred, Mother Adrienne, Sr. Joan Mary Moore, Sr. Greta Stewart (who had served previously as Sr. Wilfred), Sr. Kathleen Daly, and Sr. Ellen Marie McGovern. The RSHM sisters have remained a steady and nurturing presence in our school through the present day. Sr. Ellen Marie McGovern retired in 2006, after more than twenty-five years of service to our parish. In those early years, the many RSHM sisters who taught in our school resided in the convent at Our Lady of Corvallis High School at 3921 Laurel Canyon in Studio City. Corvallis closed in the mid 1980's and although many of the original buildings are still in use, the campus now belongs to Osaka University of Los Angeles. In addition to the RSHM sisters and many Diocesan priests, numerous laypeople have also served in our school. A student of the very first, first grade class, Joan Pierson, would return years later to teach -- first grade of course! She dedicated more than thirty years of service to our parish. In fact a number of alumni have since returned to St. Francis de Sales serving as teachers, coaches, and staff members. Many have taught the children of their former classmates, and some are now teaching the second generation of families -- the children of their very first students. Today, enrollment remains steady at approximately three hundred ten children in nine grades Kindergarten through 8th.